SBS has a unique role in Australian society and an increase in public funding is justified. Income from advertising as a major source of revenue for SBS combined with government funding has not been sufficient for SBS to keep up with the financial pressures brought upon it by multi-channels. SBS’s gross television advertising revenues decreased in 2010-11 and overall revenues have not kept pace with increasing operational costs. In 2010, SBS announced its Social Inclusion and Cohesion Policy which is in step with the Federal Government’s Social Inclusion Principles. The implementation of the SBS social inclusion policy requires substantial government funding. This policy lays the foundation from which SBS can develop its practices, understandings, programming and other policies. 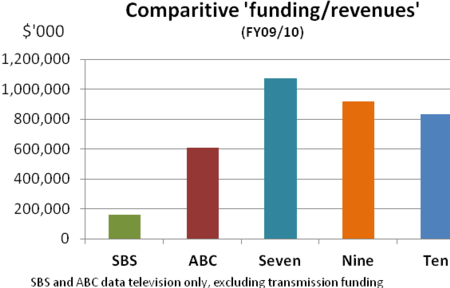 Although SBS is smaller than the ABC it is disproportionately underfunded. The output of the SBS is comparable to at least half that of the ABC, but its base funding is far less. Placing unrealistic expectations of securing revenue from advertising, SBS has under estimated the funds required and appropriation monies needed to carry out basic services. There is overwhelming evidence that the rate of growth from advertising decreased significantly and in parallel to and post the introduction of the current in‑program advertising breaks policy on SBS‑TV. We conclude the current policy is flawed and that average annual appropriation monies for SBS ought to be increased significantly by not less than either $105m p.a. if SBS takes on virtually no new initiatives – or – by not less than $190m p.a. if SBS updates its services to that of a modern, culturally relevant, media organisation over the forward estimates (2012-2015). The graphs in this document are best viewed in colour. This paper covers two main areas; the financial and the social aspects of funding the SBS. The Special Broadcasting Service (SBS) is established under the SBS Act and its purpose is guided by its Charter; the umbrella statement of Australia’s multicultural broadcaster. SBS is a microcosm of society not just on-air, but internally in its day to day operation. Few public organisations foster multiculturalism, diversity and social inclusion to the extent that SBS does. The peoples of SBS and contributors may take credit for nurturing much of this, and with fewer resources than other broadcasters. In 2009-10, SBS total revenue was less than ¼ for that of the average Australian commercial network. This includes government support and income from commercial activities, including advertising. In the same year the total revenue for the SBS (from all sources) was $308.4 million. The average advertising revenue for each of the three free-to-air commercial TV networks was $1,231 million, or about four times the revenue for all SBS output, including its television, radio and internet services. For the 2009-12 triennium SBS received less than ¼ of the funding that the ABC received from the public purse. Funding for SBS television is as little as one sixth compared to the highest commercial network annual budget. By every measure, SBS was the least funded broadcaster in the period mentioned. Since 1991, SBS has been permitted to broadcast 5 minutes of advertisements per hour. Until late 2006 all advertising on SBS-TV, was placed between programs only (except for big sports events like the FIFA Word Cup – held every four years). However the inadequate financial resources available to SBS ‘forced’ it to seek additional funds through a change in their then advertising model, when in late 2006, SBS introduced in‑program advertising. Since then all programs have been disrupted numerous times per hour for advertising breaks. With this change, advertisers replaced viewers as the clients of SBS, while viewers became a product to be on-sold to advertisers. Ratings became important. Adjustments were made to appease advertisers and this fundamental change mobilised a ground swell of electors seeking government funding for the SBS specifically to reverse the above    . In the light of the above, a number of questions arise. Would the SBS be better or worse served with a change in advertising policy, such as a doubling of permitted advertising from 5 to 10 minutes per hour – or – would SBS and consumers of SBS be better served with a return to the former model, where the breaks only occurred between programs? The answer to these questions can be divided into four broad categories: financial, intent, perception, and social inclusion. Revenue from television advertisements accounted for almost all of total advertising revenues on SBS. There was a steady increase in revenue from advertising from 2001 to 2008. Although the year by year dollars increased with each year, the rate of growth slowed towards the end of this period. Post 2010 revenue growth from television advertising was negative. 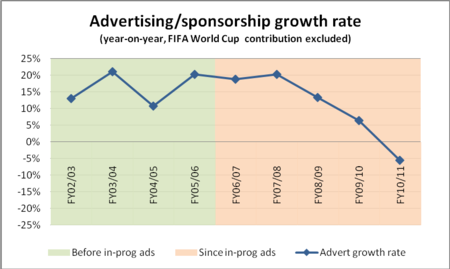 If the negative rate of growth from advertising continues with the same decline as is current, by 2015, it will be minus 37% (excluding the temporary spike caused every 4 years during the very high rating FIFA World Cup broadcasts). In October 2010 SBS predicted forecasts to FY ending 2015 were that the growth rate of revenue from advertising would fall . At the time SBS introduced in‑program advertising and subsequently, SBS predicted that reliance on revenues from advertising would not be sustainable in the longer term . Graph 2 above confirms those forecasts. Despite the change of SBS policy to introduce in‑program ad breaks, SBS has been unable to sell their full quota of 5 minutes per hour. There is no evidence to support the notion that a change in law to allow SBS to double its permitted advertising to broadcast 10 minutes per hour or more would result in a financial gain to SBS at all. Predicably viewers would object to the idea of increasing advertisements on SBS considering there is ample evidence that the electorate preferred the ‘old’ SBS advertising model of pre‑2006, where all ad breaks were only between programs and not in them. From a financial perspective, SBS was in fact better off under that model in terms of advertising revenues growth rate. Aside from the change of late 2006 to disrupt program for commercial breaks, SBS undertook a range of wholesale changes in an effort to attain their full quota of 5 minutes of advertising in every hour. None of the changes documented above or below have ever achieved that aim. At the time that the SBS changed to the new (now current) model to allow in‑program advertising, more people were engaged to sell advertising. SBS ‘relaxed’ its policy on the type of advertisement it was prepared to accept   . Under the old model, only the ‘soft sell’ advertisers were accepted whereas under the new model, almost any type of advertiser became acceptable. Despite these changes advertisers invariably continue to invest in the mainstream commercial networks (SEVEN, NINE and TEN) where they are virtually guaranteed a return, in part due to the demographic of the commercial broadcasters. The niche demographics of SBS change with every program. This makes SBS decidedly unattractive to many advertisers. The aim by SBS to charge a higher rate for an ad placed in program failed because the market demands discounting across the board. Hence SBS charges the same rate for advertisements regardless of whether they were placed between programs or in-programs. This outcome has ensured the in‑program breaks policy is close to worthless. In the past SBS overestimated the possibilities from advertising while underestimating budget monies requested from government. In 2010-11 total television advertising revenue for SBS was forecast to be $65m then revised down to $50m however the year concluded less than that. A snapshot of three time points at the beginning, middle and end of the past decade is useful. Gross revenue from advertising in 2001-02 was $23.6m (excluding revenues from the FIFA World Cup). By 2005-06 the total advertising revenue was $46.5m. Of this, $33.2m came from television only advertising (when programs were not interrupted for advertising) and the FIFA World Cup generated a further $11.39m in that year. GRAPH 3: Snapshot of advertising revenues (SBS-TV) from three time periods from 2001 to 2011      . The two green bars on the left of the chart are when adverts were between programs (past policy). The amber bar on the right (current policy) is with in‑programs ad breaks. The above points to a strong argument in favour of requiring SBS cease in‑program advertising breaks and that breaks only occur between programs. Conversely any increase of permitted advertising would achieve nothing and ignore the fiscal evidence cited and also that intended by the 1991 Parliament when SBS was corporatised. The intent and understanding in debating the SBS Bill (now the Act) in 1991, was that advertisements would “top and tail programs”, except during the natural break of a sporting event. “advertisement–at the beginning and the end of the sponsored program. In that way the viewers were not disturbed and were not constantly interrupted, as is the case on some of the commercial television programs” (Mr Lee Labor). Section 45 of the SBS Act states that SBS may broadcast advertisements during “natural program breaks” but the Act fails to define that phrase – although the intent of the Parliament is well documented in Hansard  (see quote box above & references). The current definition was self‑determined by SBS in 2006 and reaffirmed by SBS in 2010 . It does not take account of the Parliament’s intent. This SBS definition was described as being: “inconsistent with the intent of the limits that the legislation attempted to set” and not in accordance with the people who were involved in the drafting of the SBS Act (Senator Conroy) . The Hansard clearly shows the legislators never intended in‑program breaks on SBS television.
. . . combines creative and market pressures on broadcasters to achieve society’s aims for its broadcasting market. It does so by setting off a ‘virtuous circle’ with its commercial competitors. Because of its unique role and funding method, a PSB can popularise new styles of programming, and thereby encourage commercial broadcasters to create their own distinctive programs. In this way the viewing standards of the entire market are raised. Many PSBs are funded, at least partly, through advertising. Our survey shows clearly the potential dangers of this approach. We have found evidence that the higher the advertising revenue as a proportion of total revenues, the less distinctive a public service broadcaster is likely to be. The McKinsey survey concluded that the greater the advertising income that a PSB received, the more it looked like a commercial broadcaster and the less is looked like a public service broadcaster. There is evidence of this with SBS. The introduction of in program advertising to the SBS in effect makes the SBS a de facto fourth free-to-air commercial television station and serves to erode the fundamental tenets of public broadcasting- that is, that it should be free from commercial and political influence (Senator Conroy). The SBS places two breaks in a half hour television program plus a break on conclusion of the program. This therefore means that when 2 half-hour programs are scheduled back to back, there are in fact 6 breaks in total for that hour of viewing. This is more than commercial broadcasters who schedule 4 to 5 in-program breaks in a one hour program slot. The SBS Charter includes the entire packaging of the SBS – not just the program content – and the manner in which SBS television in particular presents itself, now like that of a commercial broadcaster, led viewers to think of the SBS as deviating from its “special” purpose. In 2007 some 1,119 people emailed politicians seeking more funding for SBS and legislative restrictions to prevent disruptions into programs. In 2008 more than 7,500 people requested an end to the disruptions into programs by an amendment to the SBS Act coupled with full funding for the SBS. In a small study conducted when SBS had been interrupting all television programs for just on two years, 96.3 percent of the 1,733 participants said they wanted “SBS-TV to stop interrupting programs for commercial breaks” and 95.9 percent said they wanted “government to legislate to prevent programs from being interrupted on SBS-TV”. In 2008, more than one-thousand public submissions were made to the DBCDE ABC SBS Review and it is interesting to note that of those that commented on the SBS only, almost all expressed the view of wanting the government to legislate to prohibit SBS from interrupting programs for commercial breaks . By 2010 more than 15,400 had directly asked their parliamentarians to increase public funding for SBS so that it would be free from advertising, to amend the SBS Act accordingly, saying – an investment in SBS would be an investment in Australia’s future cultural diversity. By any measure there is a ground swell of electors who wish for all of these things. The ‘experiment’ since 2007 that commenced with the introduction of in‑program commercial breaks questioned the unique and “special” nature of the SBS . Since late 2006, SBS has juggled between two masters: advertisers and audience. However the two are not always compatible. The dangers of a public broadcaster taking the commercial path, whether by necessity or desire, were documented as a tendency of the broadcaster to move away from its Charter in order to satisfy its clients, the advertisers. An overview of the market and advertising research reports carried out for SBS . . . confirms anecdotal accounts of the effects of advertising culture on SBS programming . . . that it has had a profound effect on the broadcaster in shifting the orientation of SBS away from the terms of the Charter and towards satisfying market conditions. One of the dominant criticisms . . . was the appropriateness of a public service broadcaster being so led by community attitudes; when its Charter quite clearly requires it should instead be leading the community in attitude change. In 2010, SBS actively sought to move in a new direction. After months of community consultation the SBS Board, under the Chairmanship of Joe Skrzynski, announced the SBS Social Inclusion and Cohesion Policy. This move can only be applauded and is the right policy for SBS. It recognises and takes into account the diverse mix that makes up the Australian society; a world example of multiculturalism and ethnic communities living within the one country. SBS’s Social Inclusion and Cohesion Policy is on the back of their Second Reconciliation Action Plan (RAP) which is SBS’s policy and practice about increasing awareness of the contribution of Aboriginal & Torres Strait Islander communities to Australian society and building capacity to learn from and serve Aboriginal & Torres Strait Islander peoples. Unlike the National Indigenous Television (NITV) service which is restricted, SBS could play an important role in serving Australia’s Aboriginal & Torres Strait Islander peoples due to SBS being a national free‑to‑air broadcaster. The SBS Social Inclusion Policy is in step with the Federal Government’s Social Inclusion Principles announced earlier this year. This is part of a whole of government policy and the release of the federal government’s booklet, Australia’s Multicultural Policy – The People of Australia published February 2011, articulates that. The SBS social inclusion and cohesion policy will build on those principles and if the SBS is properly funded, not only will it flourish but it will reflect the government’s goal that “reaffirms the Government’s unwavering support for a culturally diverse and socially cohesive nation”  (Chris Bowen, Minister for Immigration, and Citizenship; &, Kate Lundy, Parliamentary Secretary for Immigration and Multicultural Affairs). This policy is the foundation of SBS, from which its practices, understandings, programming and other policies may develop. However the ongoing implementation of the SBS social inclusion policy requires substantial government funding. The policy may be at risk of failure without such. If that occurred that could be to the detriment and worthiness of the SBS policy direction and would also undermine the desire of the government’s social inclusion and cohesion policy and principles referred to above. While programs remain disrupted for commercial breaks, SBS will be at risk of proceeding down the path that economists call the Principle of Minimum Differentiation. This is a dangerous path for a public broadcaster to adopt.
. . . stations based on advertising revenue will seek to maximize their audience (and thereby their revenue). Stations will therefore duplicate program types as long as the audience share obtained is greater than that from other programs. Hence a number of stations may compete by sharing a market for one type of program (such as crime dramas) and still do better in audience numbers than by providing programs of other types (such as arts and culture). In economics this point is an application of the Principle of Minimum Differentiation, a principle also capable of explaining such associated phenomenon as why bank branches may cluster together, why airline schedules may be parallel, and why political parties may have convergent policy platforms. The introduction of in-program breaks in late 2006 is a form of the above. By its nature, it reaffirms the status quo – like that of the commercial broadcasters, disrupts in the same manner, opposes diversity of presentation [A] (as does 7; 9; and 10), and conflicts with the principles of social inclusion. The original purpose of in-program advertising was a promise that the revenue from advertising would be used to “increase the production of Australian multicultural drama and documentaries”. That did not always happen. In 2009-10 none of the $22.7m advertising revenue from major sporting events (FIFA World Cup; Ashes & One Day International Series) was used for such purpose. The above highlights an outcome resulting from inadequate funding from the public purse. Development and expansion of SBS’s internet services. Expansion of other television channels. Funding for innovative multiculturally relevant programs in an Australian context. With increased government funding there could be relevant opportunities for Australia’s culturally and linguistically diverse (CALD) communities too, for example:-. Expansion of news services relevant to communities from an Australian perspective. Expansion of audio language services to those areas not currently serviced. Improvement of migrant representation in media and language skills including English language tuition. Expansion of local content to convey multicultural Australian stories. Expansion and development of mobile internet services including apps across every platform. Establishment of an SBS archiving service. Funding for languages other than English (LOTE) productions, both imported and produced locally. Development of the SBS music language services that connect with younger migrant audiences such as digital audio broadcasts (DAB), podcasts and associated internet apps. Development of online news services. Journalistic opportunities for people of non-English speaking backgrounds. The above are worthy of investment but out of reach of SBS in the absence of a very significant increase in public funding. Similarly low levels of public funding have meant that SBS broadcasts less Australian content compared to its peers. The expansion of multi‑channels in the commercial sector added to financial difficulties for SBS. There are now 16 free-to-air television broadcasters in capital cities (ABC has 4 channels; SBS, 2 channels; community, 1 channel; SEVEN, three channels; NINE, three channels; and, TEN, three channels) compared with a few years ago, when there were then only six. The above is not surprising as when in-program advertising was introduced in late 2006, SBS stated that that model would only be sustainable for 10 years at the most. That time has now arrived. 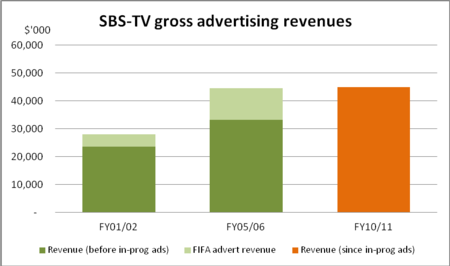 SBS requested less funding than required, evidenced by the debt of concluding financial years, which was in part due to a false belief that revenue from advertising would grow when in fact the growth rate has declined with the advent of in‑program advertising and multichannelling (refer to GRAPHS 2 & 3). This highlights the need to increase government funding significantly for SBS and remove in‑program breaks. However the fine balancing act that SBS struggles – program and Charter requirements versus declining advertising dollars is based on a model flawed for a public broadcaster, that in‑program advertising will save the day. That strategy has failed. If comparing SBS to Australian commercial broadcasters, or to public broadcasters overseas, or only the ABC, the SBS is very underfunded. Even without comparison to other Australian broadcasters, SBS is worthy of an increase in funding due to its unique role within Australian society. The cultural worth of SBS deserves nurturing. In the context of the SBS social inclusion and social cohesion policy and the whole of government’s Social Inclusion Principles for Australia, such policies can only be achieved with a combination of greater government funding and a withdrawal of all advertising disruptions on SBS. There is no evidence that a change in law to permit greater levels of advertising would result in greater advertising revenues. There is however ample evidence that the growth rate of advertising was much higher in all the years that that SBS-TV did not disrupt programs for commercial breaks (prior to late 2006) when advertisements were positioned between program only – see GRAPHS 2 & 3. Furthermore there are a growing number of electors who would support government granting a significant increase in funding the SBS combined with legislative amendments to disallow in‑program breaks on SBS-TV as a matter of priority     . We strongly recommend this course of action. With sufficient government funding, SBS has a rightful place in Australian society and is crucial to the success of a socially inclusive society that embraces all cultures of the world, settling within Australia. To a large extent SBS has had expectations of generating revenue from advertising that are unrealistic for a niche broadcaster. Considering its past and current debt, SBS has under estimated the funds required and appropriation monies needed to carry out basic services, let alone catch up to other media organisations. If the hoped reliance on revenue from advertising continues – and the current in‑program breaks advertising policy remains – by 2015 the growth rate from advertising will be minus 37%[B] (see GRAPH 2). The only way SBS can now fulfil its Charter obligations is for government to provide much greater funding than has been the case, especially given that advertising is not sustainable and the entire in‑program advertising breaks policy on SBS television is flawed and is contrary to that intended by the Parliament (see box on lower half of page 6). (3) an abandonment of expectations that reliance on income from advertising is achievable – as it is not – or desirable for SBS. [A] Presentation refers to the manner in which advertisements and breaks are presented. [B] Not including the temporary spike caused every 4 years by the very high rating FIFA World Cup broadcasts. Deloitte 2011, SBS and ABC funding based on Portfolio Budget Statements – excl. radio and transmission but includes an allocation for TV overhead. Dr C Lawe Davies, C 1997, Multicultural Broadcasting in Australia; policies, institutions and programming, 1975-1995, PhD thesis, University of Queensland. ABC – 2009/10 FY. ABC: ABC Annual Report 2009-10 (pp. 98, 174); documentary, factual, religion & ethics, science & technology, natural history hours included. Seven; Nine Ten: ACMA, Compliance with Australian Content Standard & Children’s Television Standards for the following network/s: Seven, Nine, Ten between program start dates: January 2010 and December 2010 – figures for ATN Sydney (7); TCN Sydney (9) and TEN Sydney (10) used. SBS: PILAT – 2010 CY – SBS ONE (SBS NSW).